In a year that’s seen West Coast artists like Kendrick Lamar and Vince Staples put out albums that have gained widespread acclaim, it seems fitting that the spotlight be turned to N.W.A, the collective whose music helped define hip-hop in California. Named after their landmark album, Straight Outta Compton is a look at the beginning of the careers of Dr. Dre, Ice Cube, Eazy-E, DJ Yella, and MC Ren. With a promising round-up of talent in the roles of the young artists and both Ice Cube and Dr. Dre producing, the film should be a exciting look at the true story behind the iconic group. 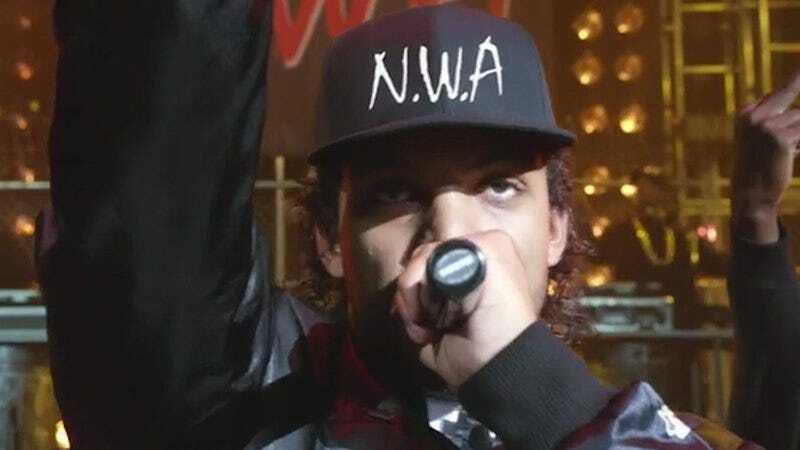 Straight Outta Compton opens everywhere on August 14, but The A.V. Club and Universal have an opportunity for you to catch it for free on August 11. For your chance to win a pair of passes to the advance screening, simply follow the link here and enter your information. Remember: Seats will be first come, first served, so be sure to arrive early. An official plot synopsis and trailer for the film can be found below.